WISER and Wits University Press invite you to join us for a public discussion of two new books. 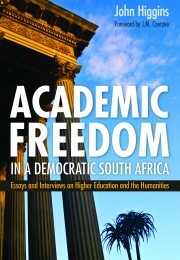 Academic Freedom in a Democratic South Africa by John Higgins, published by Wits University Press. More here. The authors will each present short, argumentative talks, followed by an open public discussion chaired by Shahid Vawda.